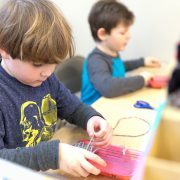 What: The FCM-FA is the parent-led group that supports activities at the school. FCM-FA organizes get-togethers for all FCM parents three times a year. 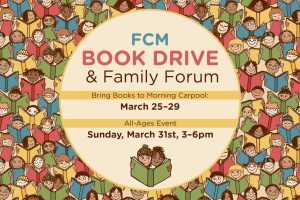 Next Forum: Sunday, March 31, 3-6 p.m. – this forum will be combined with a book-sorting event for our Books are Magic Book Drive. There will be reading, book-sorting, live music and crafts; followed by an open Parent Forum focused on diversity (facilitated by an NCSU Diversity Professional). Additional Details: Child care will be provided during the forum. An all-family potluck dinner will bring everyone back together to end this community event. Sign up here to RSVP, reserve your child care spot, bring food for the potluck, or volunteer during the drive week!